WHEN A MASSIVE STAR EXPLODES at the end of its life, the shattered remains become known as a supernova remnant. 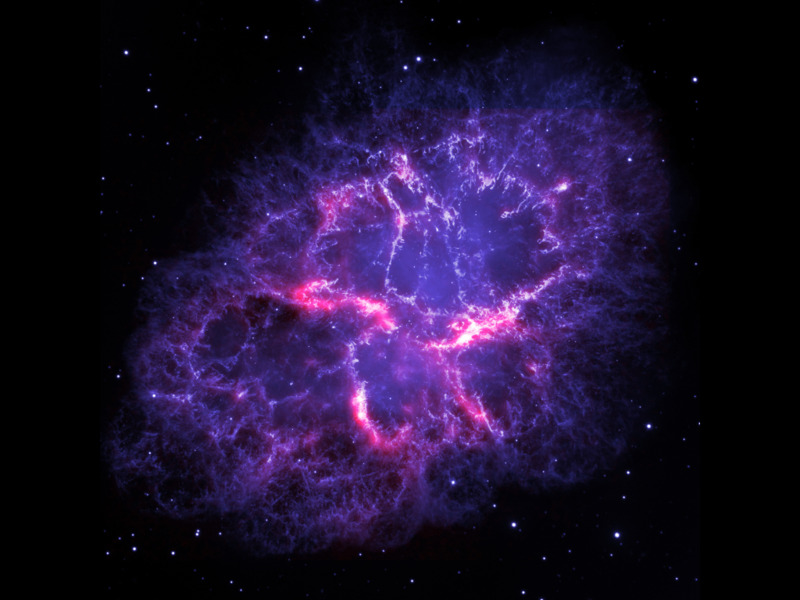 The one shown here is called the Crab Nebula. This is a composite view produced with data from two telescopes: the Herschel Space Observatory and the Hubble Space Telescope. Herschel is a European Space Agency (ESA) mission with important NASA contributions, and Hubble is a NASA mission with important ESA contributions. A wispy and filamentary cloud of gas and dust, the Crab Nebula is the remnant of a supernova explosion that was observed by Chinese astronomers in the year 1054. A new view of the Crab Nebula, a supernova remnant, using data gathered by the Herschel Space Observatory and the Hubble Space Telescope. The image combines Hubble’s view of the nebula at visible wavelengths, obtained using three different filters sensitive to the emission from oxygen and sulphur ions (both shown here in blue). Herschel’s far-infrared image (shown here in red) reveals the emission from dust in the nebula. 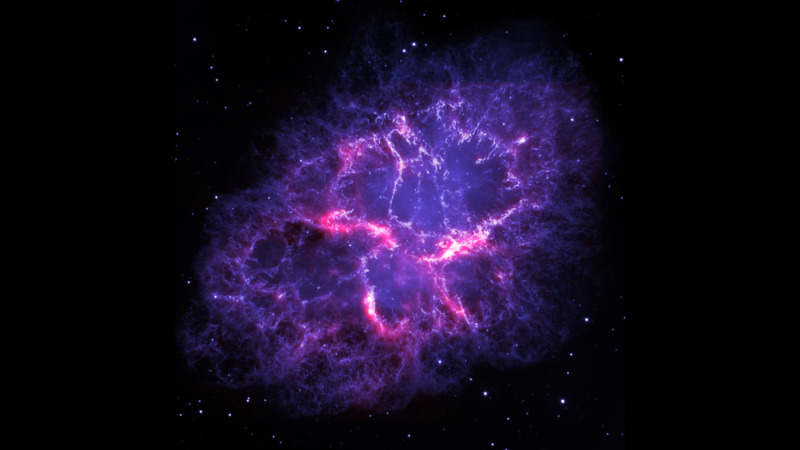 While studying the dust content of the Crab Nebula with Herschel, a team of astronomers have detected emission lines from argon hydride, a molecular ion containing the noble gas argon. This is the first detection of a noble-gas based compound in space. At the heart of the nebula is the Crab Pulsar, a rapidly spinning neutron star that emits a beam of radio waves. As the pulsar spins, the beam sweeps across the field of view as seen from Earth (a pure fluke, as it could have been pointed in any other direction). Words and image adapted from information issued by ESA / Herschel / PACS / MESS Key Programme Supernova Remnant Team; NASA, ESA and Allison Loll / Jeff Hester (Arizona State University).